Ever just wish the world would stop for a day so you could catch up? No matter how much we accomplish in a day, we nearly always feel a little guilt over what we didn’t do. But do we really have more to do than the women who came before us? Maybe not. In Taming the To-Do List, Glynnis Whitwer exposes a seismic shift in society: from one in which most of us were proactive to one in which we carry the burden of having to respond–to every email, text, tweet, and message we receive. This creates a cycle where everyone else sets the priorities for our days rather than us directing our own lives. The result? We procrastinate, putting off the important stuff for later while we tend to the “urgent” stuff right now. It’s time to take back your schedule! Ready to tame that to-do list? This book shows you how. 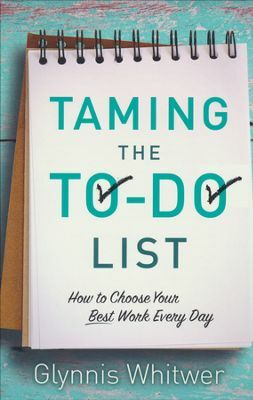 I loved Taming the To Do List because every chapter is applicable to real life, everyday issues. Ms. Whitwer talks about how procrastination is a huge problem for us and how through it, our to do lists make us overwhelmingly busy while we accomplish little. I think one of the most powerful chapters for me was Assessing the Price We Pay. “But every yes to one choice is actually also a no to something else.” (Pg. 50) She talks about how we often make choices without counting the cost of what those choices will take. Essentially, that we need to think about the commitment and choices we make that will consume our time so that we aren’t bankrupting ourselves over bad decisions. I particularly enjoyed the section at the end of each chapter called Practical Application. The short exercises help the reader to apply what they’ve learned in that chapter. Overall, the book is wonderful and a great way to not only recognize the issues over impossible to do lists, but also to deal with them. I received this book from Revell in exchange for my honest opinion which I’ve provided here.